Wednesday May 18th 1881. I was busy about the work all the forenoon. Mother went over to Hatts. In the afternoon Grandma and Aunt Mary were here. Aunt Mary and I went to Henry Mygatts funeral. He died early yesterday evening. It was after six oclock when we got home. practiced in the evening. 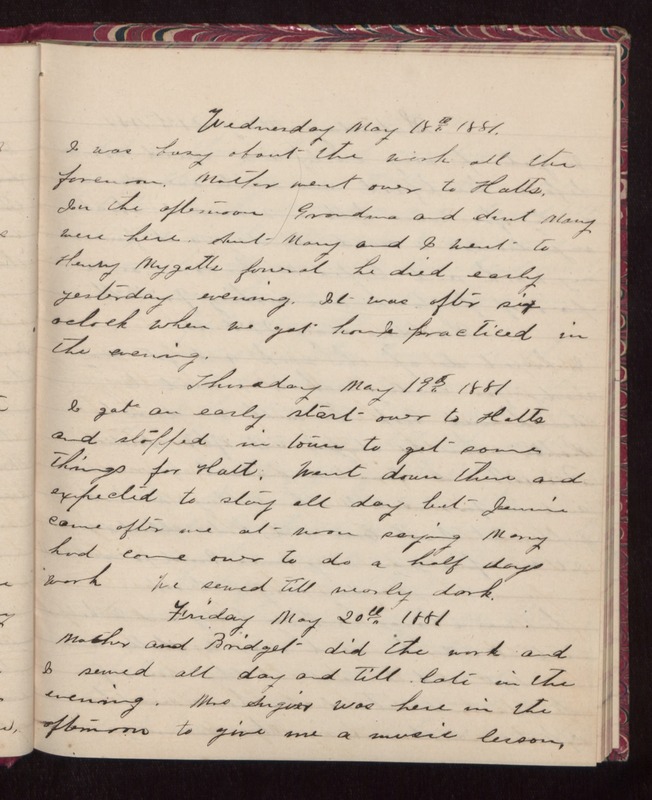 Thursday May 19th 1881 I got an early start over to Hatts and stopped in town to get some things for Hatt. Went down there and expected to stay all day but Jennie came after me at noon saying Mary had come over to do a half days work. We sewed till nearly dark. Friday May 20th 1881 Mother and Bridget did the work and I sewed all day and till late in the evening. Mrs Angier was here in the afternoon to give me a music lesson.